Acupuncture is only one of the modalities that encompasses the field of Chinese Medicine. To experience all that Chinese Medicine has to offer, you would be exposed to an entire health care system that consists of Herbal Therapy, Food Therapy, Massage, Cupping and Guasha as well as Acupuncture. The beauty of this medicine lies not in the therapies themselves but the exquisite understanding of somatic functions and detailed observation techniques that tell a Chinese Medical Practitioner everything that they need to know about the underlying pathology of the human body. The diagnostic process is the key to discovering the hidden blockages that lead to disease. The best way I have found to describe how acupuncture works is this. The body contains a complex system of pathways, similar to our veinous or arterial system, known as meridians. These pathways allow our energy, or Qi to travel effortlessly through our bodies. For any number of reasons these pathways can become blocked impeding the flow of Qi and blood. Having originally been trained in massage therapy I have found it vital in my practice to palpate these energy lines. Based on patient symptomatology you are certain to find depressed, tender areas along the meridian pathways. These depressions are known as “Ashi” points, areas where the energy is blocked. Inserting acupuncture needles into these Ashi points draws energy to the area, much like a lightning rod attracts lightning. Drawing the energy to the area dissolves the blockage, restoring proper flow throughout the meridian system. 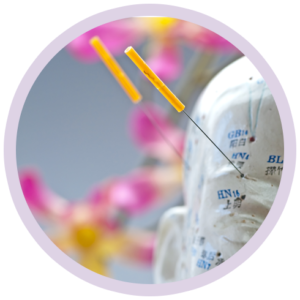 An acupuncture treatment is a complex prescription of multiple needle insertions that creates a cohesive set of instructions for the body to follow with each acupuncture point exerting a very specific function within that prescription. Chinese Herbal Therapy is one of the most complex areas of Chinese Medicine. Plant parts such as flowers, fruits, seeds, stems, roots and bark are harvested and used in herbal tinctures and decoctions as well as minerals and shells. Everything that you need to ward off disease is available to us in its unadulterated form straight from nature. 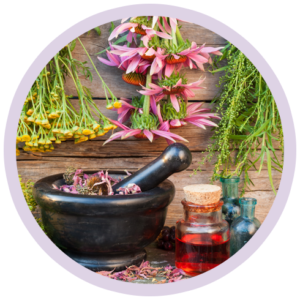 Single herbs have been studied and their thermal properties recorded as to the effect they have on the human body. These singular herbs are combined with other herbs to create powerful formulations that assist the body in a limitless number of functions. We know an infection as something that needs an antibiotic to clear. In TCM Theory the body is suffering from excessive heat. There are herbal formulas that are antibacterial and antiviral in nature, they are considered cold and are able to clear excessive heat from the body, resulting in clearing of the infection negating the necessity for an antibiotic. This system of medicine has been around for thousands of years and if it were allowed to coexist with our current health care system, being accessible to everyone through our insurance system, we would all benefit greatly from that union. Chinese Food Therapy is unique in the aspect that it takes into account your individual differential diagnosis and in an essence prescribes foods that will correct those imbalances. 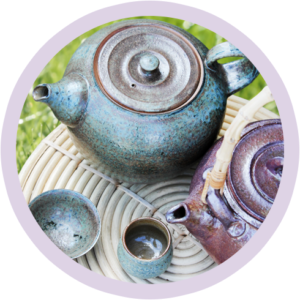 Foods are broken down into thermal properties as well as their effect on Yin, Yang, Qi & Blood. Foods are further broken down into the 5 Flavors of Pungent, Sweet, Sour, Bitter & Salty. Each one of these flavors exhibit a different effect on the body. Pungent or Spicy flavors most directly affect the meridians of the Lung & Large Intestine which stimulate the appetite and promote Qi circulation. Sweet foods belong to the Spleen & Stomach and are generally building or tonifying and have a lubricating nature. Sour foods are related to the Liver & Gallbladder, these foods have an astringent nature which means that they assist the body in holding in or stopping inappropriate fluid discharge. Bitter foods belong to the Heart & Small Intestine: these foods generally have a diuretic and detoxifying effect. Salty foods are associated with the Kidney & Bladder and they are known to nourish blood and lubricate the intestines. When a balance of all of the 5 Flavors is consumed on a daily basis the systems of the body begin to work together at full capacity and weight management becomes effortless. The ancient arts of Thai Massage and Tui Na are invaluable tools that have been utilized throughout the ages to combat stagnation, remove blockages and restore range of motion. Thai massage is one of my all-time favorite forms of massage. You will experience a rejuvenating, full body palpation of the meridian system that propels energy throughout the body increasing energy flow as well as removing blockages that cause pain. This type of massage is also a form of assisted yoga. Your therapist will move you through various stretches that will lengthen and repair muscle imbalances while you experience a state of deep relaxation. Tui Na on the other hand is a modality that focuses solely on clearing stagnation. This technique is used as short segments of deep tissue work that can be a bit uncomfortable at times, yet it is very effective. There is generally no sleeping going on while Tui Na is being performed! But if you have deep rooted, chronic pain this might be the treatment you have been looking for. Cupping Therapy is a detoxification tool that is used to pull deep rooted blood stagnation that is trapped in muscle tissue up to the surface of the skin. When blood and toxins are trapped in the deeper layers of the muscles it is very difficult for them to be processed out of the body. Cupping Therapy creates a strong vacuum that draws those toxins up to the epidermis where the capillary bed is able to process them out of the body. It also separates layers of muscle tissue that have adhered themselves to each other restricting range of motion. Cupping Therapy is also used for removing lung congestion during a cold as well as helping the Bladder Channel to open up and release pathogens during the early stages of a cold or flu. Getting in to the office during the first 24-48 hours after catching a cold will greatly benefit you. These therapies combined with herbal tinctures can stop a cold or flu in its tracks. 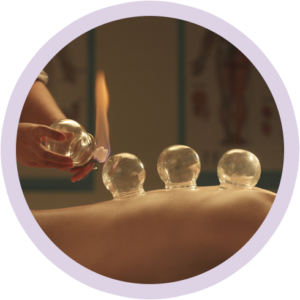 It is important to know that if your body is toxic, Cupping Therapy will leave purple marks on your back that look somewhat like bruises. These marks are known as “Sha”, depending on the amount of water you drink and your body’s ability to process toxins they will fade in 4-7 days. Guasha is similar to Cupping Therapy in the sense that it helps to bring deep stagnations out of the body. It is kind of like Cupping on steroids! And oil based lotion in placed on the painful area and a Guasha tool is used to “scrape” over the area. It is almost like watching a treasure map that has been written in invisible ink appear in front of your eyes. A road map of your pain will begin to appear on the skin and relief is not far behind. You will also experience the result of “Sha” on the skin and depending on the level of stagnation it can be quite dark in some people that are experiencing a great deal of pain. This technique is very effective for problems like frozen shoulder. The stagnation in the muscle tissue can be so bad that it shortens the muscles creating an inability to elongate, resulting in the limited range of motion. Guasha removes the stagnation allowing the muscle to lengthen and resume proper function. This technique is also used in the early stages of a cold. When you experience a sore neck at the beginning of a cold, an external pathogen has entered the most superficial channel of the body, the Bladder Channel. Guasha will open the channel allowing the pathogen to be released before it travels to deeper layers of the body. The theory behind the ancient art of Asian beauty therapy lies in the premise that inner health equals outer beauty. When your Qi is strong and able to flow freely, your inner radiance glows from your face and eyes. This is true beauty. 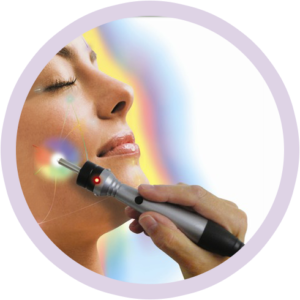 Energy Light Rejuvenation® brings together the stimulating force of microcurrent technology with the healing action of fiber optic light. Microcurrent electrical stimulation propels energy throughout the meridian system freeing stagnation and blockages that have manifested along the energetic pathways. Facial muscles are mildly stimulated which exerts a strong tonifying action that increases tonicity. This results in an incredible anti-gravity effect that defies aging. Fiber optic light is drawn into the meridian system re-establishing the full light spectrum to fragmented Qi particles. Colored light absorbs into the body exhibiting a full range of functions depending on the color spectrum used. 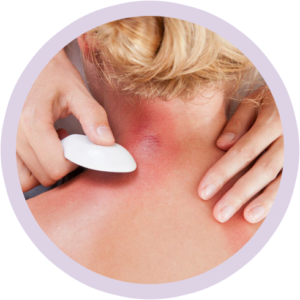 Re-introducing lost light particles into the skin drives healing to deep internal organs. Chinese facial diagnosis is used to determine where organ dysfunction exists. Your wrinkles and blemishes are actually important diagnostic factors used to establish organ imbalance. Extra time is spent in these areas and light therapy my be adjusted to feed thirsty organs through the acupuncture points of the face.